Sierra Club Florida News: Like solar? Vote NO on Amendment 1! If you support clean, renewable energy -- and more power to people -- join me in spreading the word that Amendment 1 must be defeated. There are many ways to get involved. Sign up to volunteer -- it's easy! That's why I'm coming to Florida this week to support Floridians for Solar Choice's efforts to set the record straight and stop Amendment 1. 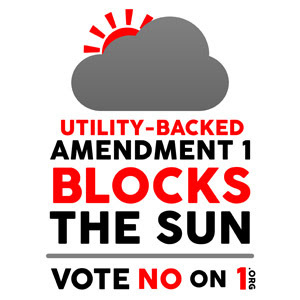 With Election Day next week, time is running out to stop Amendment 1 from ruining solar energy in Florida. Will you join me in volunteering to help inform voters? Florida has huge potential to be a superpower for clean, renewable energy. Solar power in particular has so much promise that it's right in the state nickname! If you support clean, renewable energy -- and more power to people -- join me in spreading the word that Amendment 1 must be defeated. There are many ways to get involved. Sign up to volunteer -- it's easy! Both solar energy and fighting climate change are critical to Florida's future. With so much focus on the other issues at stake in this watershed election, it's so important that voters learn the truth about Amendment 1 before it's too late. P.S. This Thursday, we're joining with Floridians for Solar Choice at a dozen press events to raise awareness about the threat posed by Amendment 1. Can you join us at one? Check the box on this form and we'll let you know where the nearest event is to you. John Schwartz, The New York Times, Measure in Florida That Claims to Back Solar Power May Discourage It, October 27, 2016. Want to learn more about Amendment 1? Click here! Paid political advertisement by Sierra Club, 1990 Central Avenue, St. Petersburg, FL 33712​.